Most parents don’t want to lug a car seat on the plane, but are even more reluctant to rent one from a car rental agency. Should they be? Don’t get my mother—we call her La G—started on car seats. She rues the day we had to “constrict” our children to those “contraptions.” (Apparently I was shuttled around in a bassinet on the floorboard.) Of course, car seats save lives, a lot of lives: They’ve helped bring down motor vehicle-related deaths in children 53% since 1975. But day-to-day, I agree with La G: Why are five-point harness seatbelts so difficult to clasp, the seats themselves so heavy? A run to the grocery store needs additional time and planning, let alone a road trip through California. Rental cars make child seat questions even more complicated. Parents have asked me, can you rent car seats, and if you reserve one, are they guaranteed? How do you know if a car seat has been in an accident, and what happens if it’s recalled? How much do they cost, and how are they cleaned? To answer these common questions, I reached out to six popular rental car agencies: Enterprise, Alamo, National, Thrifty, Hertz, and Dollar. Here’s what I discovered. Do all car rental locations offer car seats? Not necessarily. In the case of Enterprise Rent-A-Car, National Car Rental, and Alamo Rent A Car, for example, child seats are offered at all major airports as well as at locations where they are required throughout California and Florida. Are car seats reserved online guaranteed upon arrival? Yes, in the USA. And be sure to reserve them in advance. What happens to car seats that have been in an accident or recalled? All six companies noted that recalled car seats or seats that have been in an accident are immediately disposed of or recycled. Take note, however, that this is not U.S. law: There is no Federal requirement for car rental companies to discontinue a car seat if said car seat rental has been in a crash. The National Highway Traffic Safety Administration (NHTSA) has a policy, but it’s only a recommendation: “Any requirement that rental car companies must offer car seats would be based on the applicable state law or more likely, car rental company policy,” notes the NHTSA. Enterprise, National, and Alamo noted that seats don’t stay in their fleet for longer than a year. Can I pick what brand I get? Perhaps, though you’ll have to choose the car rental agency based on the brands they offer, and then call the specific agency (not the toll-free number) to ask if your preferred seat can be reserved. Hertz, Dollar and Thrifty, for example, are currently carrying Costco models. Enterprise, National, and Alamo have Costco, Evenflo and Graco brands. This is always subject to change. All six agencies offer seats that can recline or be front or rear facing, as well as booster seats. Will someone help me install it? If they don’t have manuals on hand, it might be a sign that they’re not keeping their car seats well organized in the back of the shop. What is the price range of car seat rentals by day? It depends on the agency’s location, but Enterprise, National, and Alamo seats average at $9.99 a day. Hertz, Dollar and Thrifty seats are $13.99/day with a max of $98.00, and AAA members get one free car seat. If you’re nervous about the quality and care of the car seat you might get, pick up the phone and call the car rental agency directly (again, not the toll-free number, but the exact location from which you’re renting). 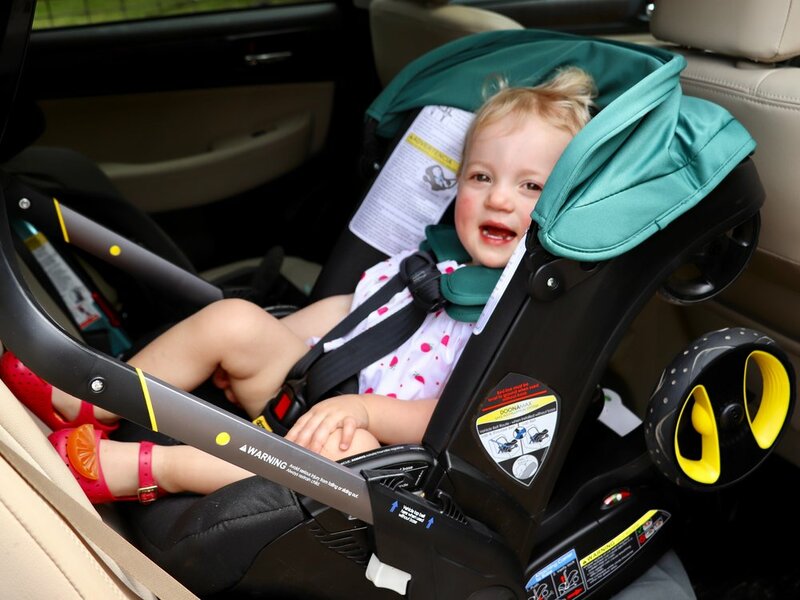 Ask an agent how recently the company bought their car seats, how they’re stored and cared for, and confirm they’ll have a manual on hand for you to refer to for installation. You’ll quickly get a sense as to whether the agency’s car seats are top of mind, or an afterthought. Here’s a list of 10 questions to ask your car rental location about child travel and safety. As noted, there is no federal requirement for car rental companies to discontinue a car seat if said car seat rental has been in a crash, and general state laws on car seats vary widely. For an overview of state car seat laws, click here. Whether you’re in your own car or a rental car, stay up to date on the CDC’s recommendations for child passenger safety. Did I miss one of your questions on car seat rentals? Send it my way!